I like electronic music. I think that i have made that perfectly clear in my reviews here. I like hearing computer-manipulated sounds, and i think that some really interesting stuff can be done that way. Sure, it's fundamentally different from organic music. It often seems "cold" or "removed". I think that's an effect of there being a machine directly between the performer and the listener. It often doesn't feel as "alive" to me as music made by a bunch of people with guitars. But that's not always the case. And the Underland EP by Miles Tilmann is a perfect example of that. This music seems alive in some way. It breathes, moves, and flows in a very nice and relaxing fashion. I think it's all in the keyboards. 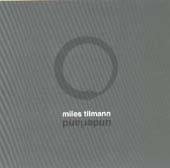 As i know from seeing him perform, Tilmann plays the keyboards that are all over this disc. It's not purely electronic music, it's some sort of synth pop hybrid. I guess it's the logical next step after Depeche Mode and those keyboard based bands of the 80's. Whatever. It's a pretty cool EP though. It's very relaxing, with keyboard washes flowing in and out, and sampled beats booming through layers of echo. It clocks in at exactly 29 minutes, and Tilmann crams 8 songs into that timeframe. Let's examine them, shall we? Underland starts with the aptly named Unfold. An ambient drone glows warmly and then subdued head-bopping beats pulse in. Way in the background are torn up vocal samples that exist in some subconscious and not quite understood realm. It's like waking up at a concert, the song persists in a pre-wakefulness state. Relaxing, yet moving at the same time. Unfold blossoms into the brief interlude of Letting. This is a very ambient track in which a deep bass sound wavers alongside keyboard drones. It's a sci-fi soundtrack type of song -- the sort of music that is played as a huge starship floats by on some sinister task, no doubt loaded up with heavily-armed bad guys. But this ship apparently has some engine trouble. The next track, Underland is a lovely little piece of slowly building keyboards and crunchy beats that start, hesitate, and stop. Snippets of stuttering voices join the beats. This song really reminds me a lot of Telephasic Workshop, my favorite track off of Music Has The Right To Children by Boards Of Canada. Of course, the texture of the song is different, but that whole stuttering vocal samples thing is really similar. Not to say that i think Tilmann is ripping of BoC, but rather than both artists use this nifty effect of creating an interesting rhythmic texture out of heavily manipulated vocals. I like the effect, but i understand how this might not really be for everyone, especially those who really like to hear what the voices are saying. After his Boards Of Canada moment, Tilmann gives us Warm/Cool, which is an ambient interlude similar in nature to Letting. It's another short tune of deep bass. Nice. Sunday brings back the beats, but this time they are totally flattened out -- a heavily muffled kick drum sample and some fuzzy cymbal hits drive this interlude along. It too is over before you know it, bringing the EP to Mother/Father. The beats come back into focus, and Tilmann plays a happy little keyboard riff over top of them. They keyboards drive this song as synth washes ebb and flow over the drum beats. The synths completely take over for Memory 4, another short interlude. Tilmann uses these interludes quite nicely. They break up the pace of the album and return the listener to a state of rest after each of the beat driven tunes. Tilmann wraps things up with Derail, which takes up a whole third of the EP by itself. It's a slowly building song of echoed keyboards and good solid drum beats. It gets your head bopping. It's a fun little tune, and sort of wraps up the general keyboards and beats motif of the entire disc. On the whole i am impressed by this EP. It shows a lot of potential, and makes for some really interesting listening. Tilmann makes interesting sonic textures, and i look forward to hearing more.